SCCF offers weekly walks to introduce fascinating new landscapes and wildlife to visitors and residents. From beaches to unique interior wetlands, our knowledgeable volunteers provide exciting insight into the history of the area as well as species seen along the way. Come join us! 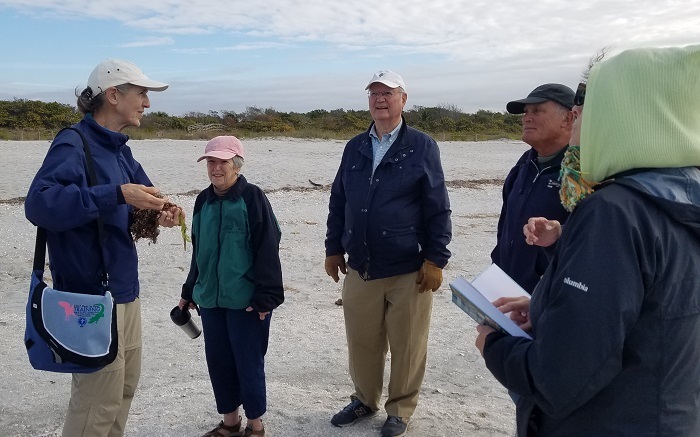 We are a group of amateur botanists who enjoy finding and identifying native plants on Sanibel and the Caloosahatchee watershed. Our walks, visiting different locations in Lee County, last for two hours, and are guided by a leader with a plant list. Depending on the location visited, you may need parking money. Please bring a hat, water, sun-block and comfortable enclosed shoes with socks. Meet at the Nature Center at 8:30am (depart at 8:45am) at the base of the porch and carpool to the site. Sanibel Island is a unique barrier island in Florida because it still has an interior freshwater wetland ecosystem that has not been lost to development. Join us for a guided walk through the interior wetlands and mid-island ridges of the Center Tract with discussion of native habitats, natural, and cultural history and preservation efforts. Trail walks will be offered through March on Tuesday through Thursday at 11 a.m. Meet at the Nature Center. Meet your SCCF guide at Bowman’s Beach at the foot of the bridge that crosses the bayou on the way to the beach. Your guide will lead you along the beach towards Blind Pass and back along the back dune/bayou trail. Keep your eyes open for shorebirds and gopher tortoises. Learn about SCCF’s 50-year role in island preservation. Free to all. You must pay to park. Check our calendar for all educational programming here.